We are all aware of the fact that we get energy from the food that we eat, but at times the same energy might not be available to us as the sugar levels in our body go haywire. Any kind of imbalance of sugar in our body is wrong, be it low or high, each type has its long lasting effects on our body which are detrimental for our overall well-being. 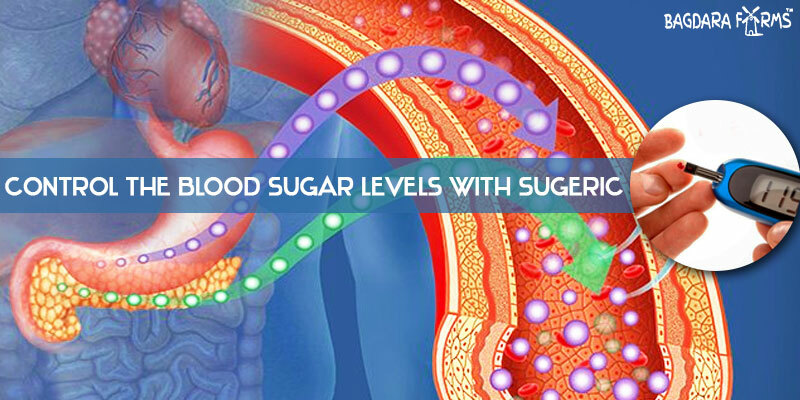 In this condition, the level of blood sugar( glucose) becomes abnormally high. High blood pressure is mostly brought on by diabetes. When the levels become too high, it can lead to a life-threatening condition called as ketoacidosis. The stand out signs are feeling thirsty all the time and the frequent urge to urinate. This condition can be brought on by various medical problems, but the most common one is diabetes mellitus. If one has diabetes it can mean one of the two things either there is not enough insulin or the insulin is there but your body is not able to use it. When we eat our pancreas release insulin which breaks up the nutrients and sugar is released, but due to inadequate insulin action at times the sugar is not available to the cells, and it accumulates in the blood, or the cells do not get enough sugar, so they begin to break down fat. When the sugar is utilised correctly, it keeps the blood sugar levels in check. If you are still thirsty and you heel the frequent urge to visit the restroom, then that is your first warning sign. If your blood sugar levels rise to an abnormal level, this can induce a diabetic coma. Over a period hyperglycemia can damage organs and tissues and can also damage and weaken the immune system considerably which can lead to poor healing of simple cuts and wounds. It can also bring about problems with the vision, kidney damage and even blood vessels might get damaged. This is a purely manageable condition and cannot be treated. The best treatment involves changing your dietary habit and also lifestyle changes. The next best thing gets yourself the tender care of Sugeric from Bagdara Farms. Sugeric like all Bagdara products is 100% organic and is curated under the strictest and cleanest methods to ensure that you get the purest and most potent product. Curcumin in Sugeric is nature’s most dynamic anti-inflammatory agent, and it this property that not only checks inflammation but also reduces it. In hyperglycemic condition, the uptake of glucose causes excess ROS (reactive oxygen species) which causes oxidative degradation in fats and also leads to oxidative damage in cells and inflammatory pathways. The oxidative stress scavenges the reactive oxygen species and maintains the sugar levels as it enhances the secretion of the anti-oxidant enzymes and all this is due to the powerful anti-oxidant property of Curcumin. Curcumin has the natural anti-hyperglycemic action which ensures lower blood sugar levels and also balances blood glucose and also the insulin level. The anti-diabetogenesis effect of curcumin not only helps prevents diabetes, but it also can reverse the condition it in some cases. Curcumin also helps bolsters the heart health and also protects it from most of the cardiovascular complications brought on by diabetes. The production of glucose by the liver is also kept in check, thus controlling the blood sugar levels. Curcumin regenerates the pancreatic cells due to its pharmacological property which is beneficial in type 1 diabetes. 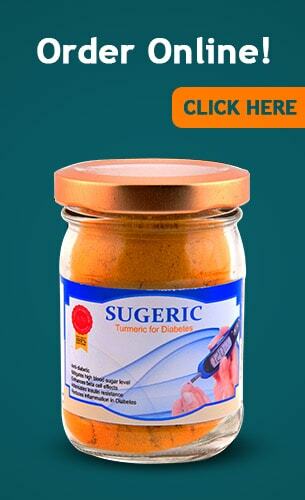 Buy Sugeric and treat Hyperglycemia. I am 40 years old and have had two episodes of hyperglycemia in quick succession. These instances have scared me immensely even though I am not sure if this is due to an onset of diabetes or not. I do not want my organs to get damaged due to frequent attacks of this kind. Can curcumin help my body process sugar better so that I do not have to suffer through hyperglycemia ever again. Curcumin has natural anti-hyperglycemic properties that help your body break down sugar better. It also makes the body much more sensitive to insulin. Curcumin is excellent at suppressing the hyperglycemia-induced inflammatory state that damages various internal organs including the kidneys and the liver. Furthermore, it stimulates the body to produce more insulin so that all the sugar is processed and none of it is left behind in excess in the bloodstream. Diabetes is not the only cause of hyperglycemia. You may be on the brink of developing some other health condition as well if you are experiencing frequent bouts of hyperglycemia. Regular curcumin supplementation will help you contain the relevant health issue. Also, make sure you speak to your physician and get yourself tested.